Versatile Design. Heavy Duty Stainless Construction. Autoquip’s Color Change Manifolds and Valves offer high quality performance and multiple options that provide versatility for a broad range of applications. Our color change valves and manifolds are engineered to provide a method of commuting a number of colors together into a single connection point, allowing a selection of an individual color and/or flushing of a color. Color manifold technology is application dependent. Selecting incorrectly can cost the user more in initial installation, thousands per week in additional waste, and ongoing lost compressed air energy. To tailor each customer system individually, Autoquip offers a wide variety of color change manifolds and color change designs. The base of each color change design is a time tested cartridge style color change valve. Autoquip has implemented tens of thousands of the Autoquip 3066 Cartridge Valve. The Autoquip success is simple. We provide a rugged stainless steel wetted valve with only Teflon and UHMW components. 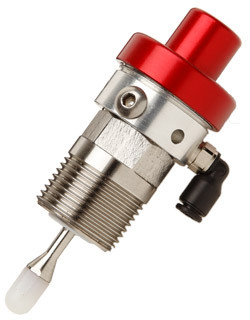 The valve provides high flow, requires little compressed air to actuate, a visual indicator to verify actuation, and is easy and inexpensive to rebuild. The Autoquip 3066 valve is paired with the appropriate manifold(s) for the application. 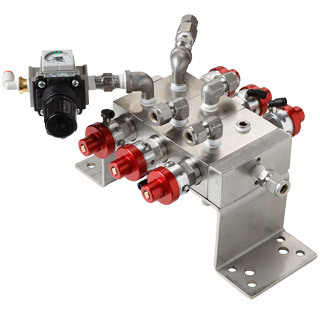 Autoquip is the only color change system manufacturer with both small and large ported manifolds, manifolds with a wide variety of fluid connection, specialty manifolds for remote flushing, and piggable manifolds. Autoquip color change solutions reduce equipment cost, installation cost, color change waste, flushing and loading time, and maintenance cost. What is a Piggable Color Change System? For customers who employ circulation systems, numerous painting stations, and need to change coatings often, Autoquip offers a unique “Piggable” color change system. Our Piggable circulation/color change system differs from a conventional system during the flushing of the circulation pipe. In a conventional circulation system, the flushing starts with an air blast chasing some of the coating from the tube, followed by pumping many gallons of flush solvent to remove the remaining coating. Autoquip’s “Piggable” circulation system introduces a foam plug “Pig” to shove nearly all of the coating out of the pipe in one quick operation. In a “Piggable” system each color pipe employs a pumping module, pig launcher, and pig receiver. The system greatly reduces flushing waste and required color-change time by recovering around 96% of the coating each color change – normally consuming less than 1 gallon of solvent per flush/load cycle. Pigging is not a new technology. Pigs have been used in the pipeline industry for decades. A paint pig, normally a bullet-shaped polyurethane foam object is shot through the paint circulation system at the end of a color run via compressed air followed by a minimal amount of solvent to force paint out of the lines. The pig normally travels through the entire line in less than a minute. Pipeline pigs can be huge, paint circulation pigs less than 0.375” to 1.0 in. The pig O.D. is slightly larger than the I.D. of the tubing to be cleaned ensuring a good seal against the tubing wall. After the “pig” removes the coating a short burst of air and solvent through the system finishes the cleaning process. Autoquip manufactures a series of special components and valves to allow the pig to pass through the entire color-change system. Air-tight, quick-disconnect fittings and integrated pig launch and retrieval help cut color-change time to less than 15 min. 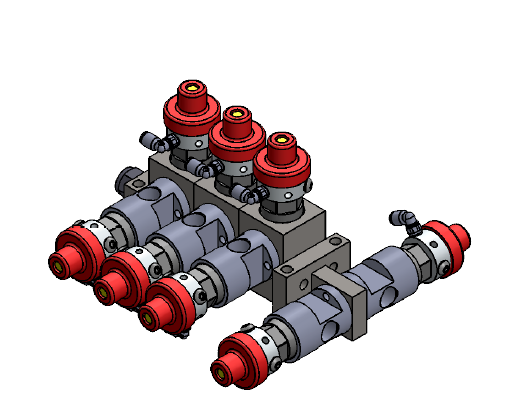 Autoquip is the only manufacturer offering a wide size variety of Piggable Manifolds, Launchers, and Receivers. Correctly sizing the Pigging System to the application optimizes the savings. If the painting system requires a ½” tube and a ¾” is installed, the required paint batch is larger to fill the circulation system, a larger pump is needed, additional compressed air energy is required to circulate the coating, the larger tube surface generates larger residual paint waste, and more solvent is required to flush to old coating. Autoquip offers a patented pump air control system to eliminate pump runaway during flushing and loading operations. Autoquip can supply equipment with engineering assistance, installation of purchased systems, or complete system integration. A Piggable Color Changer assembly is designed for use within a coating circulating system. Machined from 300 series stainless steel for corrosion, abrasion resistance and continuous use. The Piggable Color Change System is built to install on popular circulation system tubing centers using either sanitary fittings or specially designed stainless steel O-Ring fittings. The 300 series stainless steel constructed “Pig” launcher provides an efficient entry path for the “Pig.” Normally a pig is inserted in the Pig Launcher prior to introduction of the coating to the circulation system. The “Launch” is the first step in the circulation system color change process using the pig to clear the coating from the exit of the pump to the entry of the pack pressure regulator. The 300 series stainless steel constructed “Pig” receiver is installed at the end of the circulation system catching the “Pig.” The “Pig” receiver is installed prior to the back pressure regulator and includes a visual point for the operator to verify the “Pig” has returned. 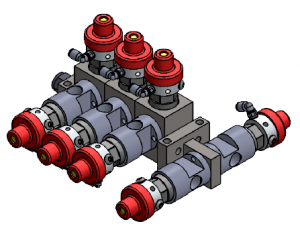 A System Module is an integrated package of Circulation pump, Pig Launcher, Pig Receiver, Special Paint Filter, Patented Paint Pump Air Flow Control, Piggable Fluid On/Off Valves, Flexible Pump Connections, and Quick Disconnect Fittings. Teflon® is a registered trademark of the DuPont Company.